Coming back to an earlier post, 8569A CRT DONOR NEEDED, I was desperately looking for a new CRT for an old 8569A. After some hints of a kind reader of this blog, I decided to give the box another try, and removed the CRT. There was nothing wrong with the grounding, or the Aquadaq coverage, but at least, there was a sign of defect – a glass chip rattling loose inside the CRT. Turned the CRT with the face to the ground and gave it a few good hits. Reconnected everything (with carefully inserting the CRT back in the box). There result – all working great again. Seems that a piece of glass got stuck in CRT deflection unit, and caused the distortion of the screen. Appears to be a pretty rare defect, but at least, the CRT should be good for now (unless you sit the 8569A on the back feet so that the glas piece can get stuck again in the deflection unit). (1) Rebuild the switch assembly and reference level encoders, about 3 hours of work, and a lot of tiny M1.2 screws, etc. (2) Some start-up issues: the 8569A would sometimes only start when the “reset” button is pushed. 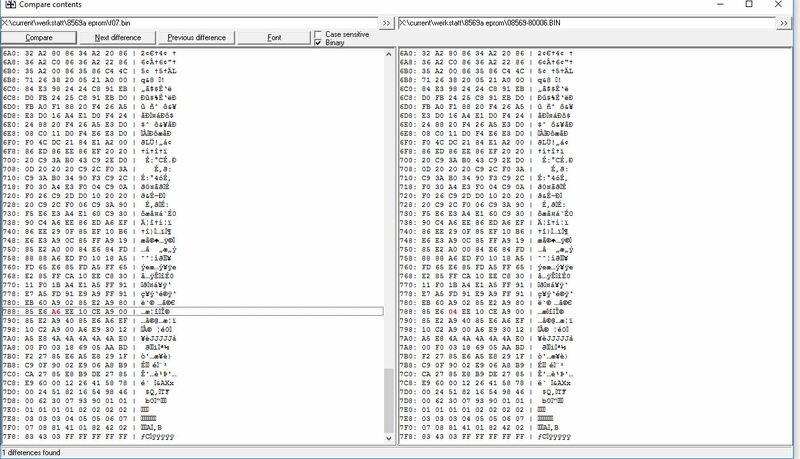 Checked the EPROMs – and, one of them corrupted. Replaced the whole set, just to be sure. These are all TMS2516 EPROMs (let me know if you need the good binary images). (3) Still more tedious work, replacing the mains filter… many wires… and the mains filter X2 cap. 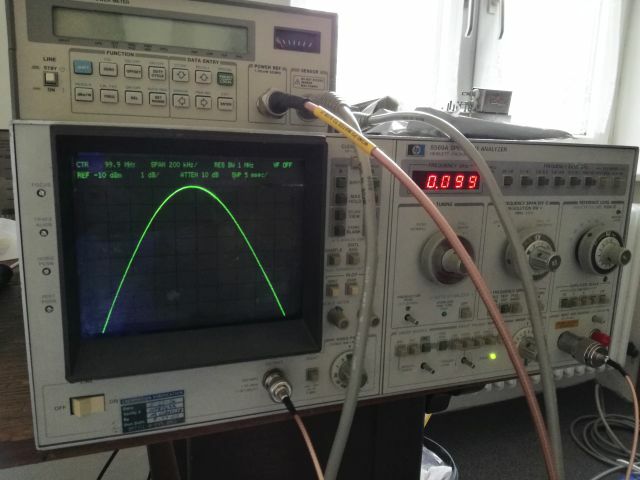 Now, some quick tests: sensitivity test of all bands, and at 18 GHz, all to specification! Also checked the power reference, with the best two powder meters at hand, all reading to at least 0.1 dB with no adjustments. This repair is done, but please, don’t put this 8569A on its rear feet! This 8569A came from the US, purchased by a local HAM operator, and in need of repair. Some switches don’t move nicely, so it seems liked a regular repair job of a 8569A. First issue, 5 minutes after turn-on, where not the switches, but a blown mains capacitor (aging X2 grade capacitor). Well, this is easy to fix. 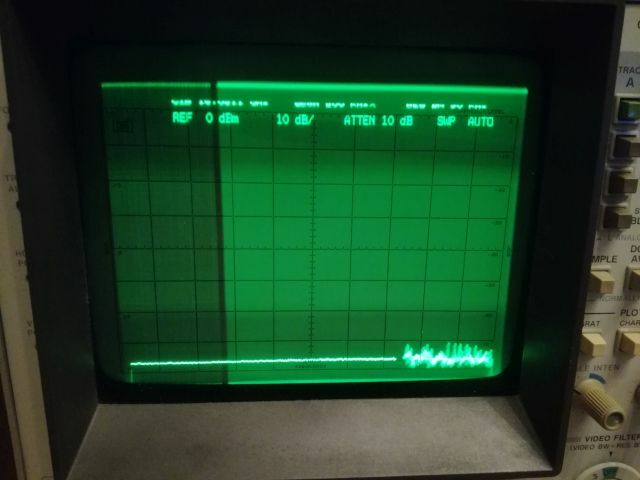 With the instrument powered on, it quickly became evident that the there is some distortion of the display, in particular, in the upper section of the CRT. This is not a common fault, and hard to explain other than by a broken deflection system of the CRT. To be absolutely sure that no other assemblies are causing this defect, the X-Y deflection signals were coupled to a working 8569A, and indeed, no distortion visible. Sure, the display is not quite synced (also because of the extension leads with alligator clips). How to proceed? Well, this will need a 8569A CRT for repair, from a donor unit. Let’s hope, at least for the HAM friend that one will come around soon. 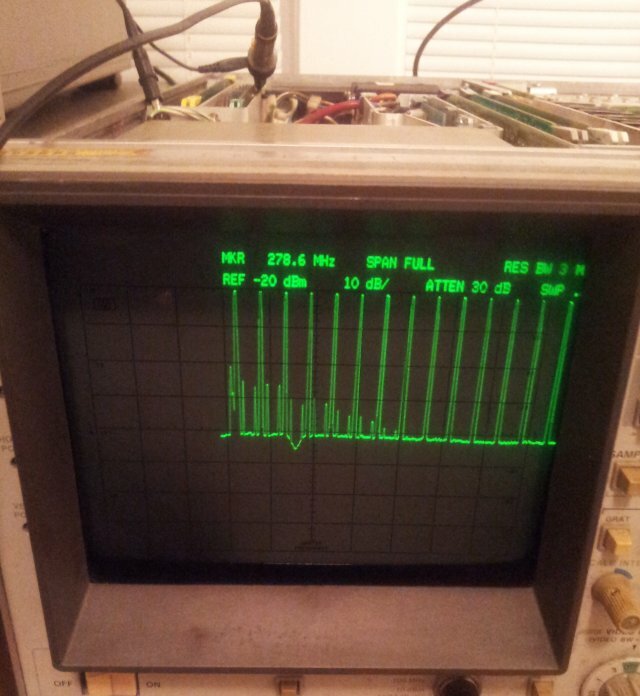 HPAK 8569A Microwave Spectrum Analyzer: some adjustments, an ultrastable 10 Volt reference, GPIB test- repair completed! The manual for the 8569A describes a series of performance tests – not all of them were completed, but most. Fortunately, the IF chain doesn’t need adjustment. Still, it took nearly three hours to get the YTF tracking, the A/D converter/digital display section and other display related circuits adjusted. The log amplifier was carefully tested as well, all perfectly in tune. 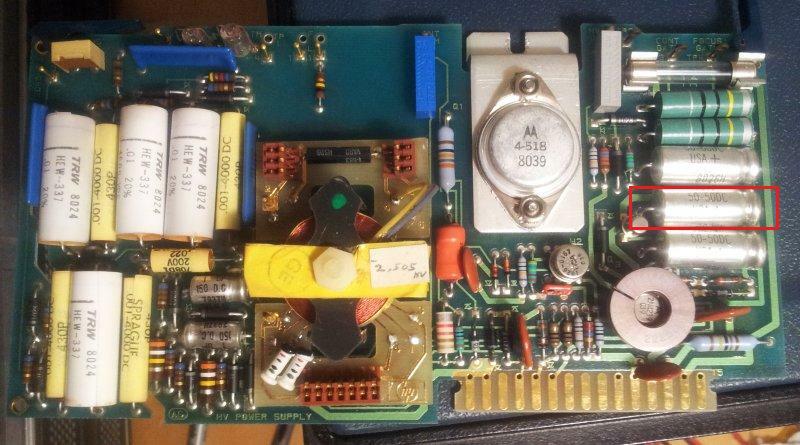 The most amazing find – the internal 10.0 V reference was found at 10.00004 V. That’s +4 ppm – most likely, better than the voltmeter I am using to measure this. 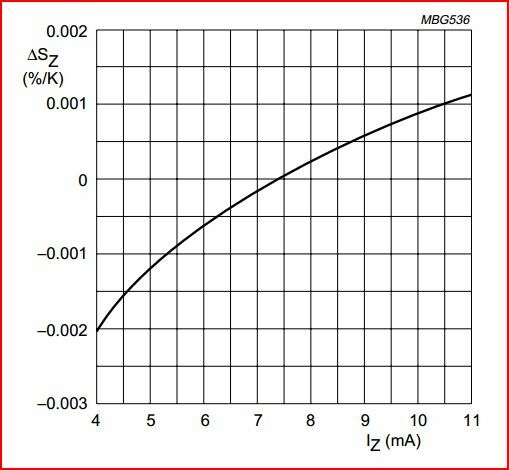 The reference circuit, according to the datasheet, is uses a regular HP/RCA low noise opamp of the late 1970s (selected 741), and a +-10 ppm/K 1N827 temperature compensated zener. 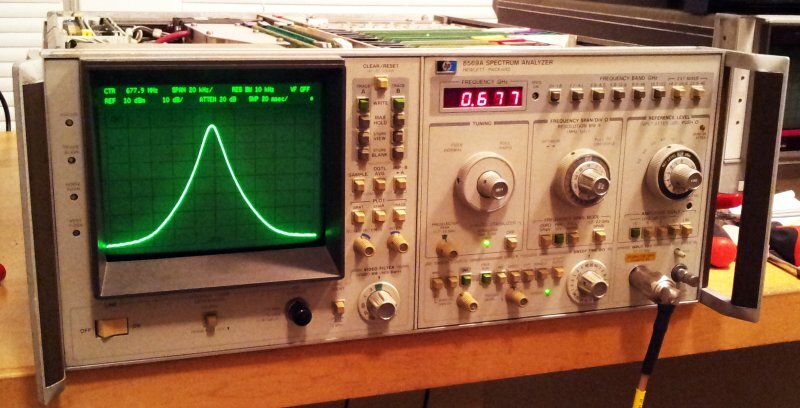 As it turns out – the actual part used is a 1826-1058, an OP-02 equivalent (0.65 µVpp noise, 8 µV/K drift), much better. Resistors in blue frame are +-10 ppm/K tempco. 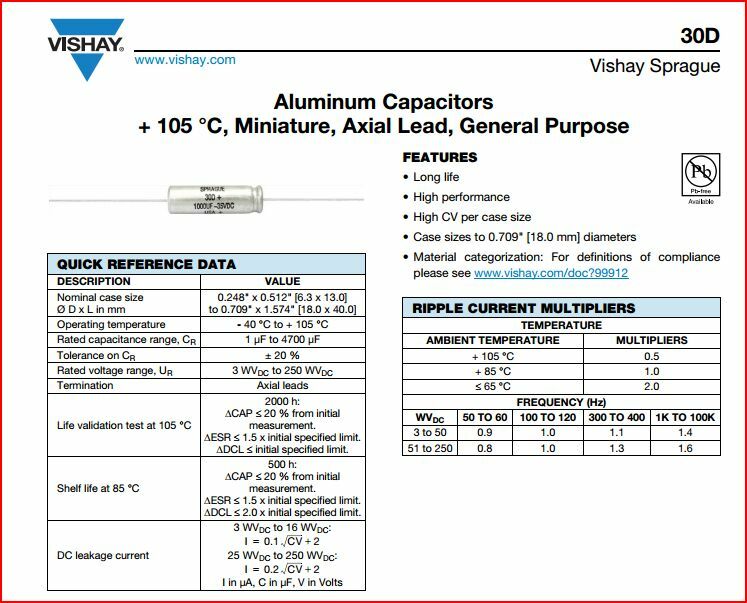 Others are regular, +-100 ppm/K resistors. The circuit layout – very much refined, a marvel of analog engineering – guard traces all around! Seems that after 34 years of aging, it is perfectly stable now. Back-up of the internal EPROMs (4x 4 kbyte!) stored – just in case they fade out over time. 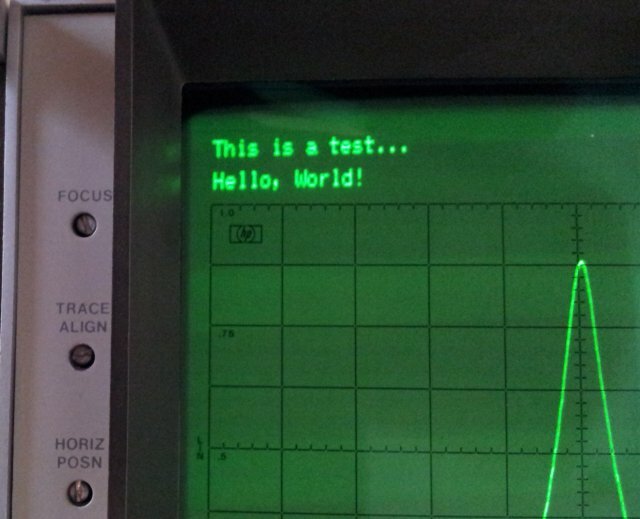 Last step – test of the GPIB functions – and, no issues at all. At its final place, for now, on top of a 3585A – total of almost 200 pounds of test equipment. Hope the bench won’t cave in. After fixing the display and front panel related issues (attenuator, “0 dB” indicator), the only major defect remaining so far is the tuning stabilizer circuit. Once the span is set to below 100 kHz, it is activated – and sets the unit to zero span, rather than the span selected, permanently. Only when the stabilizer is disabled (there is a button on the front panel), the span is back to normal. The source of this issue – most likely, the A14 tuning stabilizer assembly. Switched the board (part number 08565-60018) with the identical board of a 8565A – and, as expected, the zero span issue is gone!! Now, we just need to fix the board. 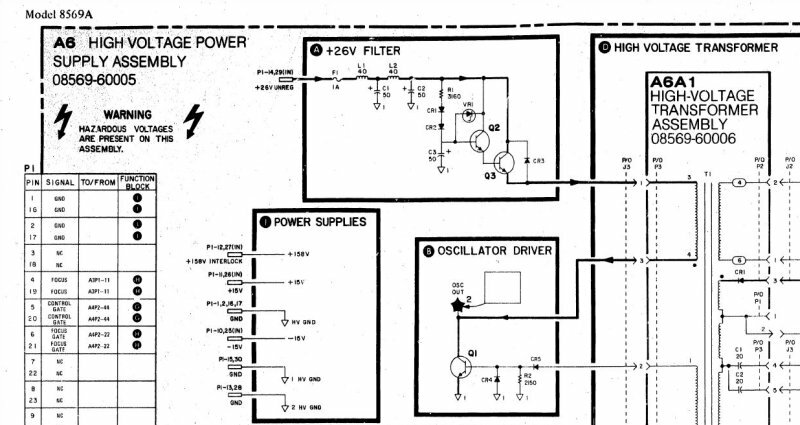 The description in the service manual is actually pretty clear – the circuit uses a 1 MHz harmonic sampler, to keep the frequency of the LO stable. The initial lock is achieved by setting the analyzer to zero span, finding a frequency close to 1 MHz that represents a lock point. 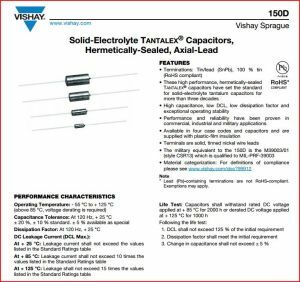 This frequency is controlled by a voltage, and a very long lasting sample-and-hold is used, than employs a special construction of a HP reed relay, and a PE/PTFE(?) 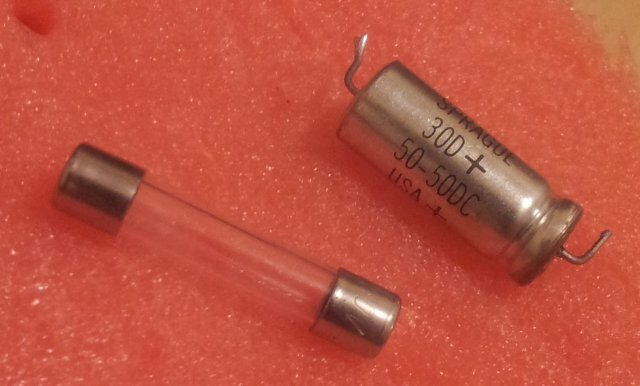 lowest leakage capacitor – the white coil in the front, left, and the the capacitor, front, right – in the middle, a PTFE isolated post, going to a FET gate. 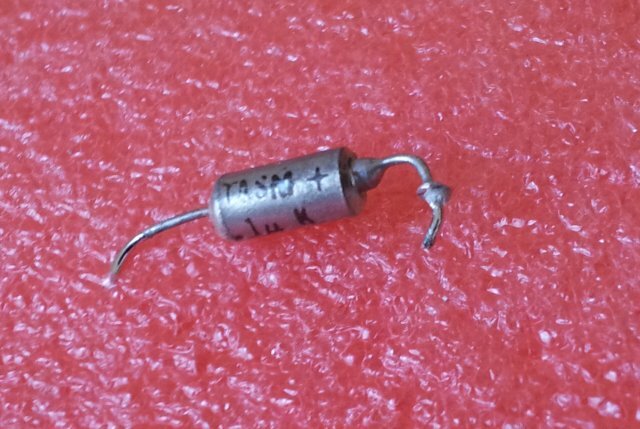 Certainly, a very special capacitor. Once this is achieved, error voltage of the sampler is used to steer the LO, and the analyzer is returned from zero to normal span mode. 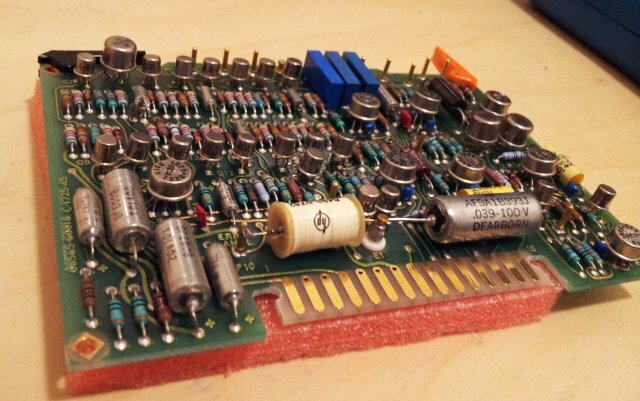 The sequence of all these steps – controlled by a very interesting chain of transistors, resistors, and capacitors – nowadays, just a few lines of program code… but, nothing better than a handful of discrete high quality components. The “control generator”, see schematic below – it is not controlling the sequence properly – and, again, a defective cap. 0.1 µF (! 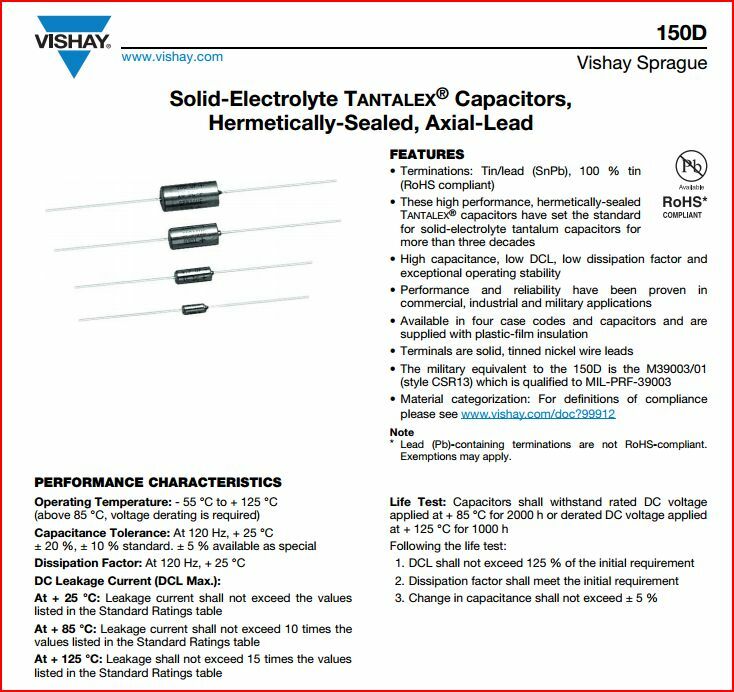 ), tantalum – red frame; a few 100 Ohms – near short. No way that this can get charged, and let the sequence proceed. Replaced it, with a regular 0.1 µF cap (why did they use a tantalum?? ), and: A14 assy working again. 20 kHz span, 10 kHz resolution bandwidth. Working just fine – at all frequencies up to 20 GHz, the highest I can check here. We can’t argue that they didn’t skim on parts – at the time, certainly, one of the best 0.1 µF tantalums available. 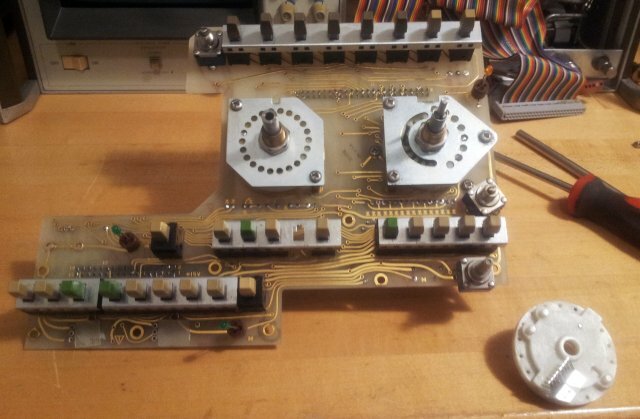 The easy of use by the three-knob operation mentioned before – it has a downside: a very complex front plate assembly. And this might be the reason why more modern units almost exclusively use single-axis rotary encoders, often only one single encoder to operate all functions, per unit. The multi-turn-coupled-limited-synchronized-geared movements, just too complex and too expensive, too heavy, too laborious to maintain. The front panel controls – as delivered. The 8569A, 8569B and 8565A all use very similar front assemblies – only seem to differ in the print and in the exact shade of the label colors. 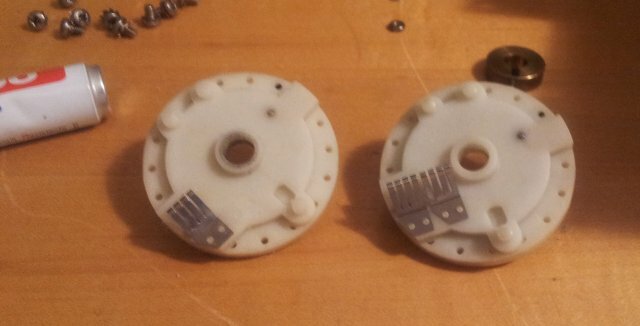 And these assemblies use plastic parts – knobs, wheels, and so on. After 30+ years, no wonder, aging has visible effect, and parts become brittle. Common defects are broken-off sliding contacts. Not a big thing, can be fixed (re-attach the contact with M1.2 screws). The attenuator and “0 dB” warning indicator – these are located on the same rotary cam, same contact pair. And, you bet, the corresponding wiper contact – broken off-missing. Well, having rebuild some of these assemblies for other repair jobs before – the only way to fix this will be to take the assembly apart, almost fully. Actually, if all screws are kept well-sorted, not really such a big effort as is sounds. Some hours, but then it will be working again. In addition to just the repair, all contacts and surfaces were thoroughly cleaned, by various means: DeOxit D5, a good eraser, isopropyl alcohol. For the painted surfaces and parts, use 40-50% isopropyl alcohol only, and a rather soft or medium-hard brush, to avoid damage to the paintwork. The replacement cam (on the right) has two wiper contacts, the defective part, only one – the plastic fingers holding it down became brittle, and it eventually broke off. Here, the result: the rebuild assembly. From earlier repairs, the remaining contacts should last – somehow, no all are susceptible to breaking-off; or it is just the amount of use they get – at least, I have some units fixed with small screws holding down the contacts, and there have since been working better than before. Therefore, I am not too worried about more contacts failing in the near future. 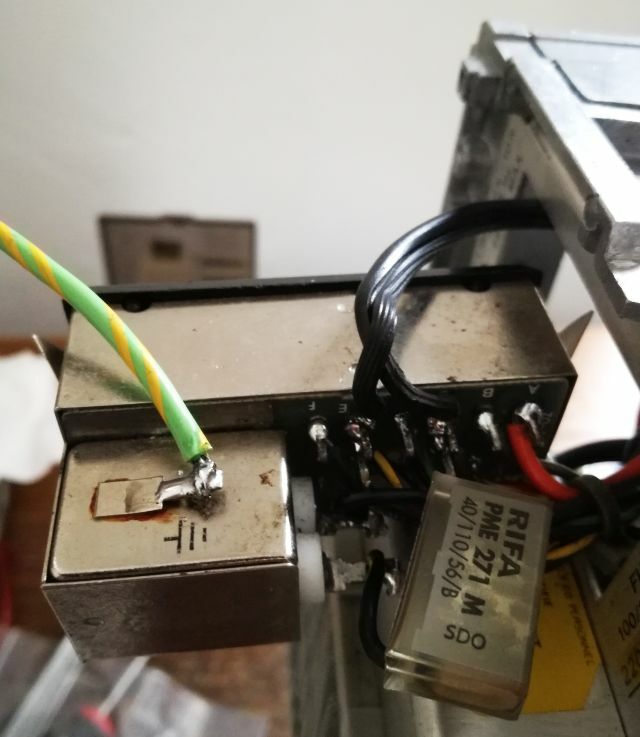 Note: as it turned out, also the 12 dB vernier attenuator encoder had a partially broken off contact – can be fixed with some epoxy glue, but I rather replaced the encoder, with a spare from the parts unit. No display – this can be bad news, because spare CRTs are hard to come by. Let’s see what we can do here. 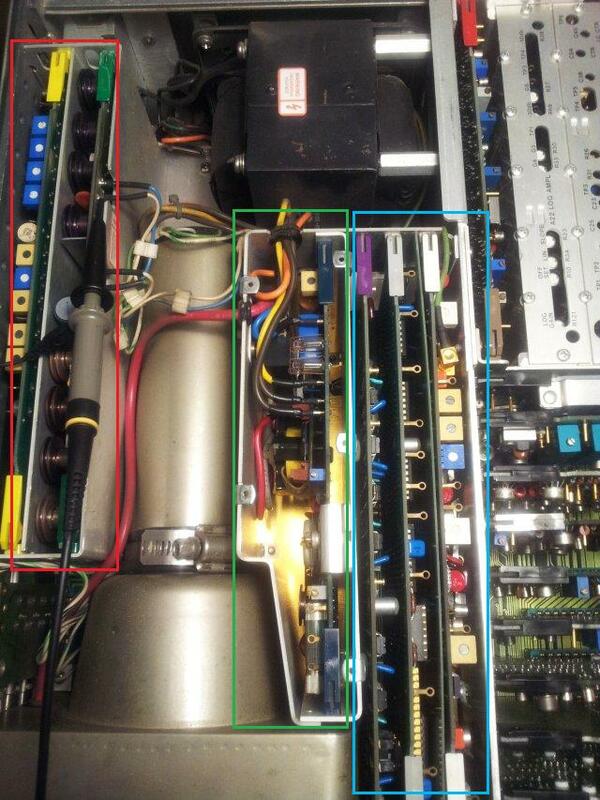 Overview of the assembly – red: XYZ driver boards; green: high voltage (and other supplies) for CRT; blue: digital circuits-video signal generator. The digital part and XYZ driver – seem to be fine, can get a nice video signal when probing around. Well, the HV power supply – no signs of life. You can easy check, just switch off the unit – there are two neon bulbs that discharge the CRT – but in the current case, all remains dark. Only three options, either the 26 V filter, the transformer, or the Q1 driver transistor. Driver transistors are a common fault – high voltage transients can damage them. But, Q1 is testing fine. The filter – well, there we go, a classic fault, a defective cap. For the time being, just replaced the defective cap, and ordered some 105°C rated long-life caps. 30D series caps aren’t cheap. So I settled for a Kemet brand type. Will be good enough. We have a working display!! And, it is actually a very good CRT – no signs of wear! Most likely, sitting in some lab at Iowa State University, as one of the labels on the case suggests, and then, stored away in a nasty shed or garage for years. Now, repair can move forward – without a display, at would be only half as useful. 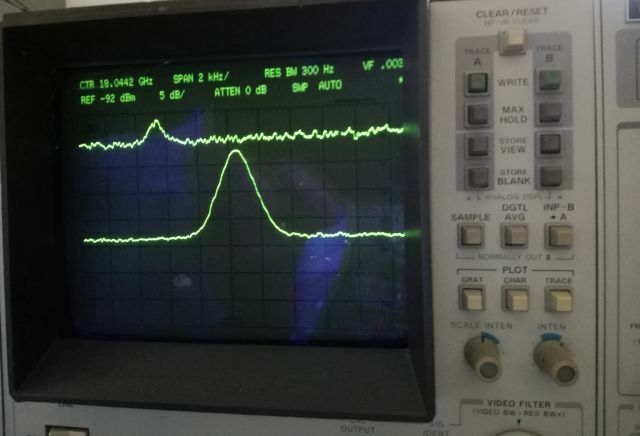 Two weeks ago I spotted something on xbay, a 8569A spectrum analyzer, for parts or repair (“powers up, no display”), at a very reasonable price – just a bit above USD 300. This is not much more than the parts value of the 70 dB attenuator of this unit, so, a great deal in any case. The pictures shows a really beaten-up unit, black dirt all over it (mould? ), and corrosion. At least the connectors seemed to have caps on them, fair enough. And it has option 1, a 100 MHz comb generator, good out to 20 GHz. Unit as offered… doesn’t look very appealing. Good news: I have a severely damaged 8565A here (broken frame, but still full of good parts), as a donor unit – looks like it is a unit that had been buried under tons of heavy stuff, or had a truck driving over it, a heavy truck. And, it doesn’t have a CRT. 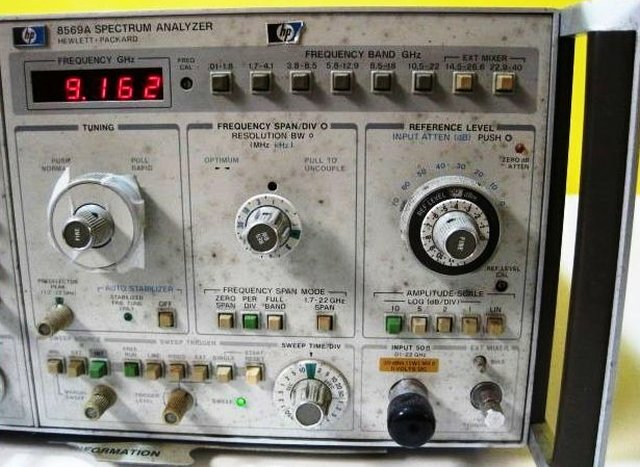 The 8565A, 8569A and 8569B analyzers – these have a really easy to use design, three-knob operation, and are the best analyzers, from my point of view, for any general service and adjustment work, at any frequency above a few MHz. With resolution bandwidth down to 100 Hz, also up for some more special tasks. 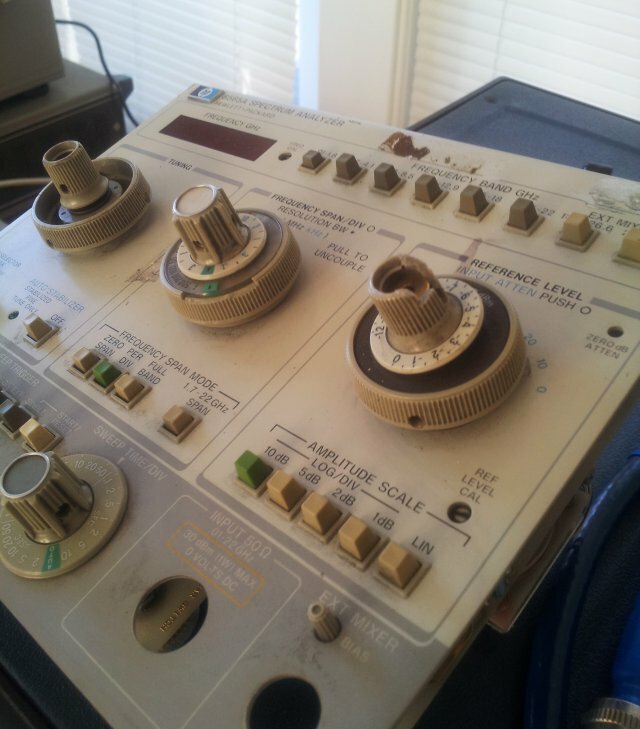 Sure, there are the 8568 and 8566 units (I also own a 8568B), but these are bulky, and you always need to push buttons AND turn knobs – more like for a cal lab or really high precision characterization work. Plenty more modern analyzers exist, with LCD display, and all kinds of software features. They come at a price, and once you have experienced the responsiveness and easy of operation of the 8569 series, fancy LCD screens and color buttons can’t really be the reason to consider anything else. Good units, fully functional-refurbished, go for about USD 2-3k. 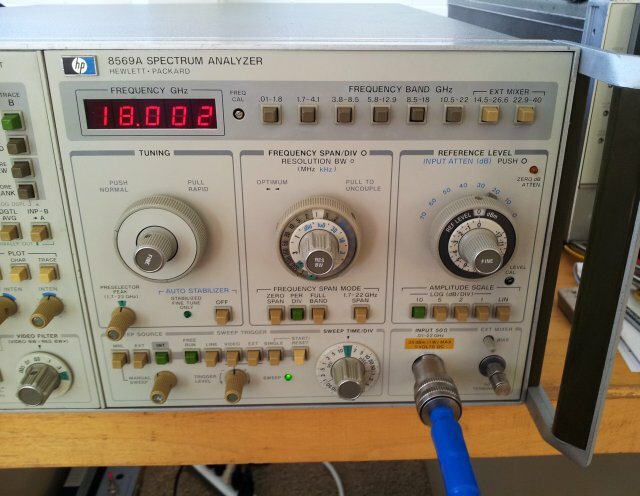 For general-purpose, low budget work – if you are looking for a 20+ GHz analyzer, there isn’t much that goes for less than 10k used, or 30-50k new. Some of the later, semi-portable 856x series might be an alternative. However, these have a rather small screen, just about 3.8″ diagonal, for the spectrum display, while the 8569B has 5.5″, and an electrostatic CRT, of excellent brilliance. Also, keep in mind that the down-converted output can be easily converted to digital data by SDR, to recover even the most complex modulation schemes. No need to pay extra dollars to get custom plugins for modern analyzers. Such things pay off for the big corporations, but if you are up for special tasks, there is no way around dealing with some software, anyway. 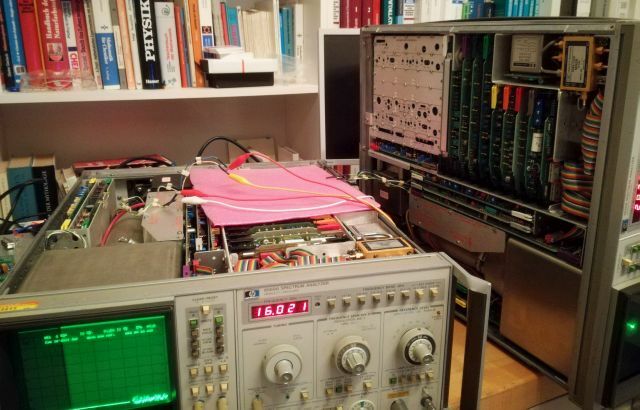 Currently, I use a 8569B in the workshop back in Germany, and here, in the US, I rely on a 8565A – which is essentially the same RF hardware, but has an analog storage display (variable persistence), rather than a digital display, like the 8659B. Also, the 8565A doesn’t have GPIB or other means of data bus, all computer-controlled measurments require the use of a A/D D/A converter unit. So, it would be good to get the 8569A working, and eventually, sell-off the 8565A. Historically, it seems the 8565A first appeared in about 1978. 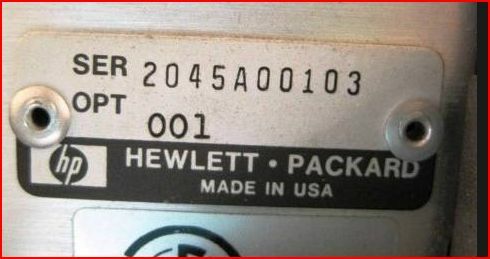 Looking up in some old HP catalogs – the 8569A appeared first in the 1982 edition (marked as “new”); quite surprising, because the unit I have here has a much earlier serial (1980) – and also the parts data back to end of 1980. No doubt, seems to be a rather early unit (take the first two digits of the serial, and add 1960 = year of manufacture). In the 1983 edition, HP already has the 8569B, with virtually identical specs. Quite interestingly, the 8565A (with the analog storage display!) remained available, in parallel with the digital-display 8569B, for many years – up until 1988 (at USD 34k, including option 1). The price difference was rather small, just about 10% (about USD 3k) more for the 8569B, with the much better display, and digital/automated control capabilities. 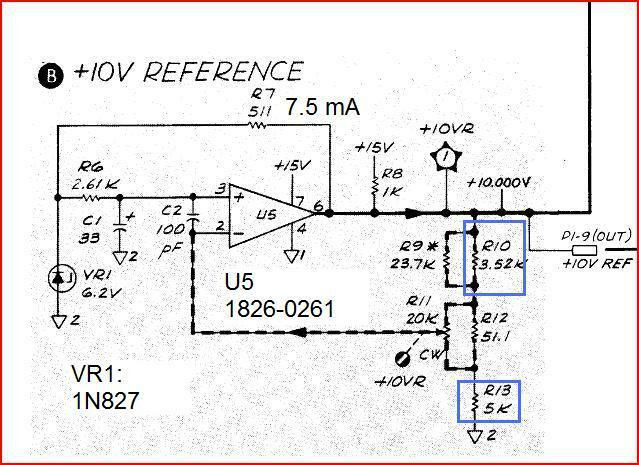 If you study the inner workings of the 856x in detail, it is also evident that a good part of the circuits were taken from 8555A analyzer, introduced in about 1970…. After all this, the analyzer arrived – well packaged. And first downside of it, it is 30 kg, 65 pounds, plus packaging. 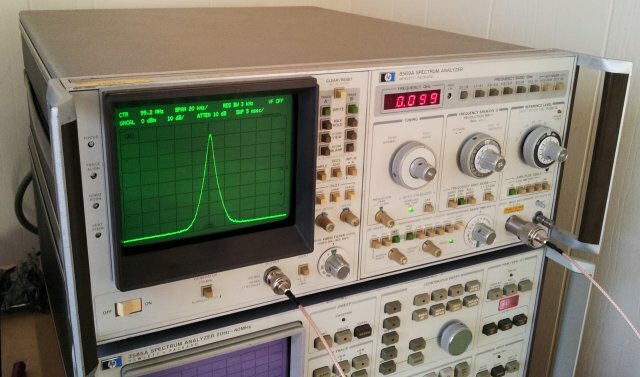 But hey, who needs to carry spectrum analyzers of this kind around – it will rest on the microwave test bench, along with generators, counters and so on, some 100s of pounds anyway. Well, plugged it in – the display is really dead, but the frequency display is on. Powder supply is good. And, the X-Y output – when connected to a scope – you can actually get some signals, and it is sweeping. There is hope. (1) No display. However, there is a display signal on the deflection plates, and it is looking sound, so the digital display generator seems to work just fine. Just the CRT isn’t. 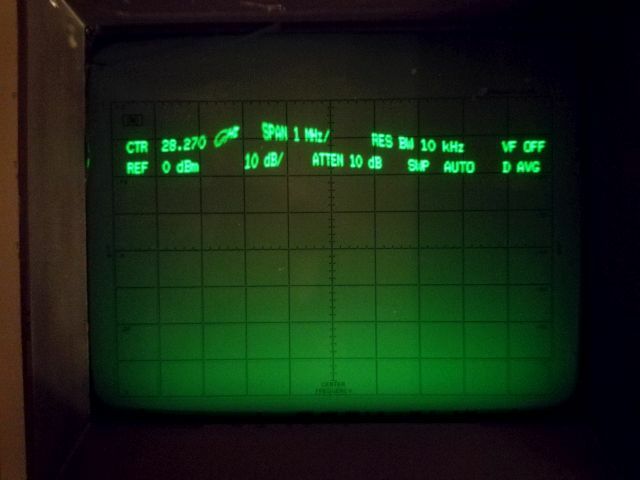 Might be hard to fix, if the CRT is at fault – I can’t see the cathode glowing…. (2) The attenuator at 60-70 dB, and “0 dB” attenuator light at the front panel – not working (missing 20 dB attenuation; light off even when attenuation is set to 0 dB. (3) Mechanical defect of the span knob – general mechanical soundness of the front panel. Will need very through cleaning, aligment, etc. 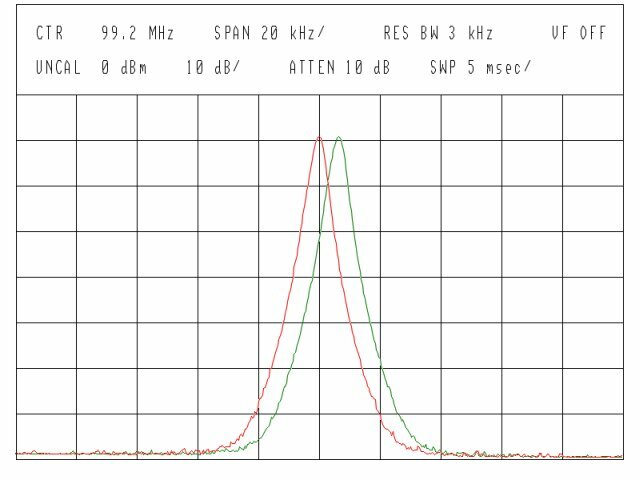 (4) Something is wrong with the tuning stabilizer, engaged at below 100 kHz span – when it is activated, it sets the span to zero, and never comes back, unless the stabilizer is de-activated.